Weekend Historical Happenings: 8/25/12 - 8/27/12 ~ The History Girl! Come visit Waterloo Village between 10:00 am and 5:00 pm for a day in this historic Morris Canal town. First-person interpreter Richard Pawling will portray canal boat captain John Hummel. Other events include: Boat rides on the Morris Canal, Smith's Store - a furnished canal-era store with hands-on activities, blacksmithing, see the operating gristmill, the Canal Museum - with exhibits and videos, featured exhibit: Canal Era in America, and guided walking tours of the village. This Saturday, the Hoboken Nine vintage baseball club returns to Dobbelaar Field on the Stevens Institute Campus at 2:00 pm to play the Jersey City Skeeters in a rematch. Come out and root for your favorite team! This event is free! The Montague Association for the Restoration of Community History (MARCH) presents speaker Kevin Woyce who will present a talked entitled "New Jersey State Parks" at the circa 1790 Foster-Armstrong House on Saturday at 1:00 pm. Kevin will share some of New Jersey's most exciting history that is found within more than two dozen State Parks. His slide show includes photographs, vintage maps, and images of historic people, events, and places. Celebrate the maritime culture and history of the Jersey Cape at Historic Cold Spring Village, Saturday and Sunday, from 10:00 am - 4:30 pm. Seafarers' Weekend will feature pirates, maritime music, family fun, and a variety of displays and demonstrations of all things nautical. The Village buildings will also be open, presenting historical interpreters in period clothing who demonstrate the trades, crafts and lifestyles of Early America. Valhalla's Pirates will join the event, bringing thrilling fight scenes both days at 12:00 pm and 3:00 pm. Captain Black and his crew will also meet with guests throughout the day to take pictures and tell tales of the sea. The New Jersey Blacksmith Association will team up with the Village's resident blacksmith to forge nautical ironware. Other highlights include afternoon musical performances by the Sea Dogs, a display from the Cape May Maritime Museum, antique boats, decoy carving, face painting and more! The Friends of HCSV will host a traditional South Jersey corn roast at the Village Pavilion from 11:00 am - 4:00 pm. The Morris County Historical Society's annual Garden Party is scheduled for Sunday, at Acorn Hall. Members and the public are invited to stroll the grounds and explore the beautiful gardens maintained by the Home Garden Club of Morristown. The Garden Party will take place from 1:00 to 4:00 p.m. Visitors are invited to bring a picnic lunch; beverages and desserts will be served. Throughout the afternoon, guests can tour Acorn Hall and its ongoing World War II exhibit. The focus, however, is on the gardens. This year, approximately 500 annuals were planted. In the spirit of the Victorian taste for what were then exotic plants, the Home Garden Club of Morristown has planted banana plants, elephant ears, and cannas to enhance the Italianate feel of the existing gardens. Coleus and other foliage and blooming plants add splashes of color throughout. The Garden Party is free for MCHS members, children under 12, veterans, and active military families as part of the Blue Star Museum initiative. Admission for all others is $6 for adults, $5 for seniors and $3 for students. Acorn Hall, the headquarters of the Morris County Historical Society, is an 1853 house remodeled into the Italianate Villa style in 1860. It is open to the public on Mondays and Thursdays from 11:00 am to 4:00 pm and on Sundays from 1:00 pm to 4:00 pm. Acorn Hall is located at 68 Morris Avenue, Morristown. For additional information call 973-267-3465 or visit www.acornhall.org. Attend the "1830s Foodways Demonstration" presented by Mercy Ingraham, Sunday from 1:00 to 4:00 pm at the Nelson House, Washington Crossing State Park. She will prepare recipes from the 1830s on the open hearth located at the Nelson House. This event is open and free to all! Join music man Rich Marzec as he performs songs from the turn of the century at Longstreet Farm on Sunday between 1:00 and 3:00 pm. Longstreet Farm is located at 44 Longstreet Road, Holmdel, New Jersey 07733. Celebrate Oliver Evans' 257th birthday on Sunday between 1:00 and 4:00 pm at the Cooper Grist Mill! Evans was a famous inventor of the 1780s who created the first automatic flour mill, the first high pressure steam engine, an amphibious vehicle, and more. See Cooper Gristmill's operational rendition of his gristmill, a collection of pictures of other mills, and antique printed flour bags. The Cooper Grist Mill is located at 74 County Highway 513, Chester, New Jersey 07930. Join Macculloch Hall on Sunday at 4:00 pm for a performance by the Libby Prison Minstrels. This fun group brings the songs of the Civil War to life in an entertaining and historically accurate way. The Minstrels have been performing the since the early 1990s with their guitar, mandolin, banjo, percussion, bass and three part vocal harmonies. The music is kept to the original styles with careful attention to a connection to the history and sounds of the period. Their moving 1861 version of the National Anthem has been performed in prestigious locations such as the New Jersey State House, Ford's Theater and the U.S. Capitol. After a fantastic performance to open the Civil War exhibit at the Museum last fall, Macuculloch Hall welcomes the Minstrels back to entertain an even bigger audience in the garden. The Minstrels will perform in the garden at 4:00 pm. Visitors will have the opportunity to explore through a variety of summer blooms in the garden and relax on the large lawn during the program. Guests may bring picnics, blankets or chairs and settle back for a late afternoon of great music in a beautiful setting. We are delighted to welcome the Delicious Ice Cream Company with its fully restored 1950 custom truck and authentic ice cream man dressed in that same old fashioned outfit you remember as a kid. A variety of treats will be on sale throughout the performance. In keeping with the performance, enjoy the current exhibit The Other Side of War: The Civil War on the Home Front. Life on the home front was not easy for loved ones whom the soldiers left behind. Women played an important role in the Union war effort; starting the U.S. Sanitary Commission, serving as nurses, gathering goods and raising money for the soldiers all contributed to the Union victory. The exhibit features letters to loved ones back home, Lincoln memorabilia from the museum's collection including a plate from his White House china, and a document signed by Lincoln as President and the Secretary of War. The Vernon Township Historical Society will present “Private Hercules McGraw: Poems of the American Civil War” by teacher and historian S. Thomas Summers. Summers, an English teacher at Wayne Hills High School and adjunct professor at Passaic County Community College, will share through poetry the journey of Private Hercules McGraw, a Confederate soldier and racist in the American Civil War. The poetry characterizes McGraw as he steps into the War to assure that slavery will exist long enough for him to purchase a slave with hopes to impress his love, Martha. As McGraw treks through the blood and mire, experiencing both triumph and tragedy, he begins to transform into a man of peace and compassion – a man who no longer sees a black man or a white man; he simply sees a man – a fellow, a brother. Summers’s poems have been published in various journals and reviews, including The Atlantic, Loch Raven Review, Literary Bohemian. Most recently, Summers contributed his poetry to an anthology commemorating New Jersey’s involvement in the Civil War, entitled New Jersey’s Civil War Odyssey. 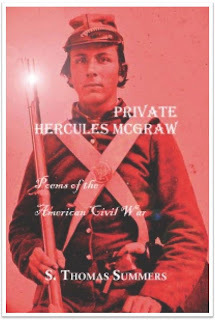 His book, Private Hercules McGraw: Poems of the American Civil War, is published by Anaphora Literary Press. The presentation by Summers is open to the public and is free admission. The event will be held in the Senior Citizens Center in the Vernon Municipal Building on Church Street. Free refreshments. For information about this event, call Jessi Paladini at 973-764-6545.